Cauliflower is identified by its edible, rounded mass of curds. 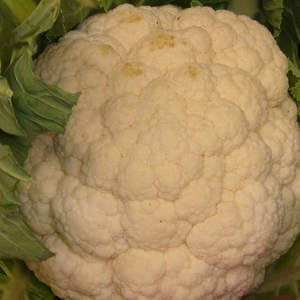 The cauliflower head grows in the center of a mass of leaves. In general, cauliflower leaves are long, narrow, and bright green in color and take up quite a bit of space. Needs plenty of water and fertilzer. A good producer when planted in summer for fall harvest.